Douleur ou pas de douleur–it was your choice! 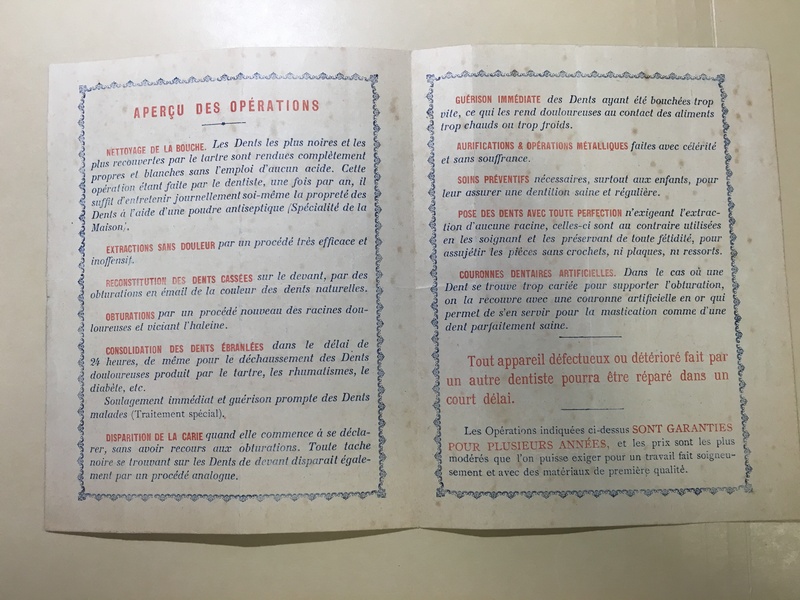 One of the things that I love about archival collections (and if you are a regular reader of this blog, you know that there are many) is how connected I am to the history that shaped our lives today. Occasionally, I am nostalgic (until I remember the lack of plumbing), but I am NEVER nostalgic when I work with medical collections and especially dental collections. 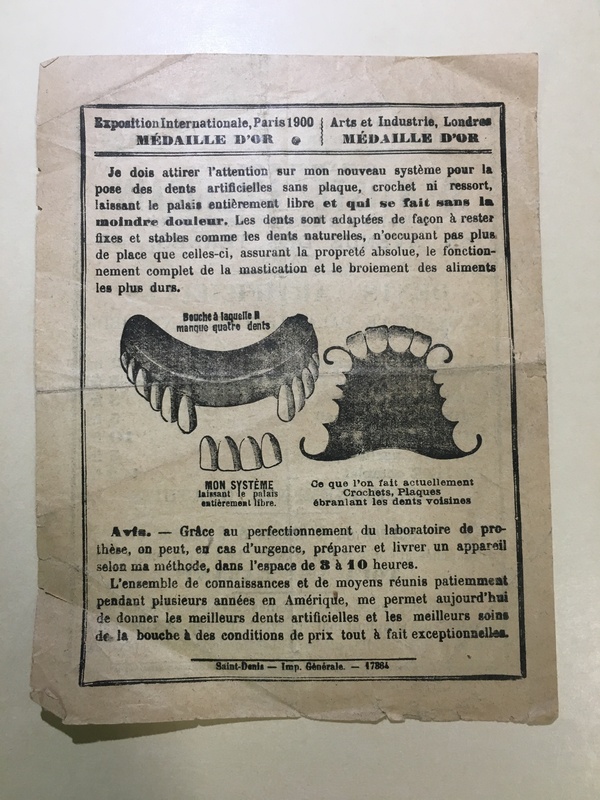 I recently worked with a small collection of French dental ephemera and was, as always, surprised by how much the field of dentistry has advanced over the last 100 years. 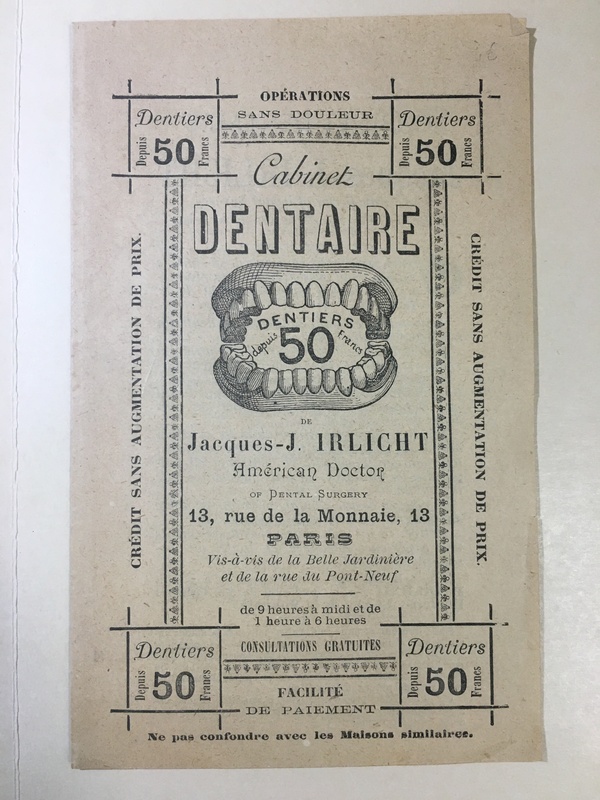 This collections consists largely of advertisements for dental offices (or cabinets dentaire) in France. Most of the them advertised American dentists or American methods and bragged about all sort of new methods and drugs. I was most entertained by the ones that offered patients the choice between pain-free and, presumably, pain-filled procedures. The real question was how much was a pain-free experience worth? Because one did have to pay extra for it! What sorts of services were available for a patient? Just a few are nettoyage de la bouche (cleaning the mouth), extractions sans douleur (painless extractions), reconstitution des dents cassés (fixing broken teeth), obturations (fillings), disparition de la carie (removing decay), aurifications & opérations métalliques (capping teeth), soins préventifs (preventive care), plombage (sealing), and couronnes dentaires artificielles (crowns). Gold caps could be made quickly and without any suffering! Painless extractions by a very effective and inoffensive procedure! Teeth filled by a new procedure! Be aware that beauty WAS important … not just the science and medicine behind these awesome new and if, you were willing to shell out the extra francs, painless procedures. 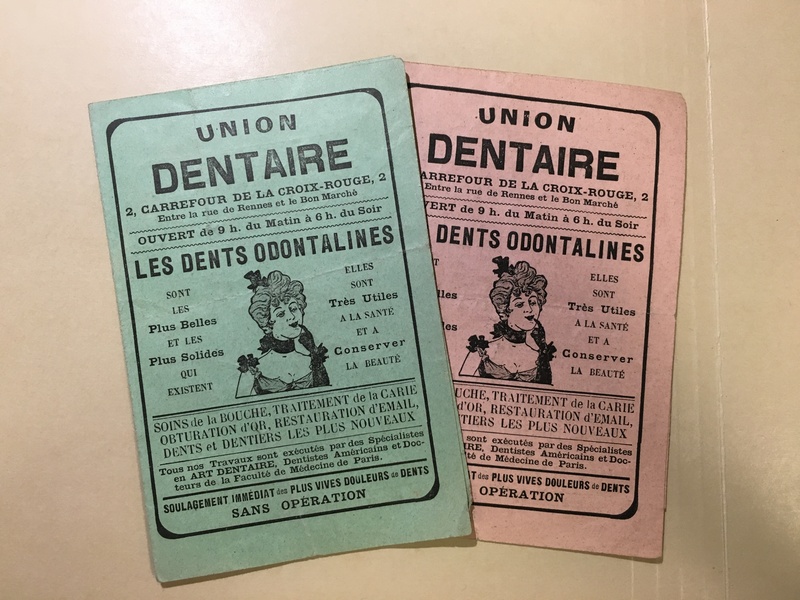 The Union Dentaire chose to highlight Les Dents Odontalines (possibly a brand of denture?) which were advertised as the most beautiful and the most solid that exist as well as being useful for health and beauty. A few other dental offices used a fair and smiling lady on their brochures, no doubt as a little extra incentive. Come explore this fun collection and perhaps next time you go to the dentist, you can inquire as to how much less your procedure will cost if you go for the pain-filled experience! This entry was posted in Uncategorized by Holly Mengel. Bookmark the permalink.